A tasty stuffing for fresh trout with Mexican chorizo, mushrooms and a side of crispy potatoes dipped in lemony garlicky mayo… Easy, Fast and Perfect for the upcoming fishing season. A tasty stuffing for fresh trout with Mexican chorizo, mushrooms and a side of crispy potatoes dipped in lemony garlicky mayo... Easy, Fast and Perfect for the upcoming fishing season! Patatas braves are a favorite tapas the Spanish serve in bars. They are crispy on the outside and soft on the inside, and dipped with the lemon garlic aioli!! Clean whole trout and remove scales. Lay the trout on a foil lined pan and open trout, skin side down. Mince shallots and add to a large sauté pan with butter. Chop mushrooms into small pieces. Add the mushrooms and 1 tbs. canola oil to the shallots, and sauté for 2 minutes. Add the chorizo and frozen corn to the pan and heat for 2 minutes. Remove the pan and stir in the bread crumbs. Divide the stuffing into to halves. 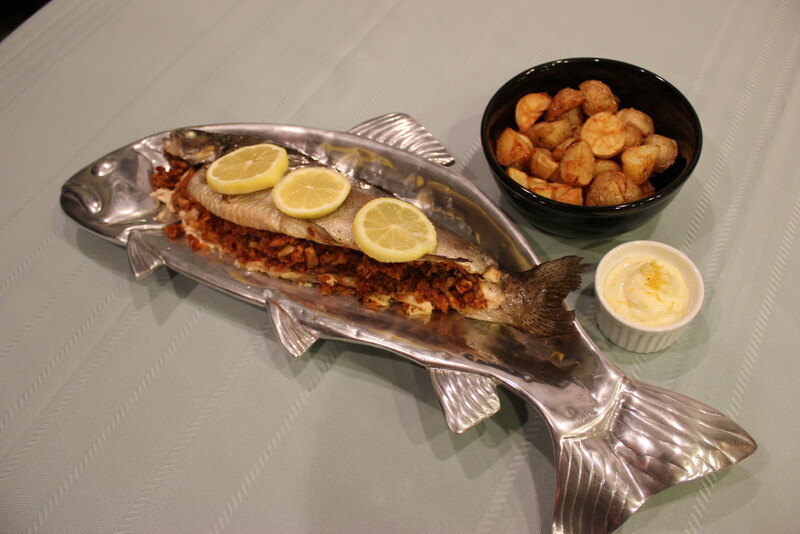 Stuff each trout with stuffing and fold over the trout and tie with cooking twine. Bake the trout in the oven for about 10 minutes. Squeeze lemon wedges over the fish, if desired. Boil the whole skin on potatoes in a pot of salted water, until just fork tender. Drain the potatoes and rinse with cold water, drain again. Once the potatoes are cooled slightly, cut the potatoes into small cubes and set aside. Heat the oil in a pot or heat a deep fryer to 350 degrees. Add the cubed potatoes, a few at a time and fry until golden brown. Immediately season with salt, pepper and Spanish paprika. Serve with lemon garlic mayo. Zest half a lemon and mince the lemon zest into very small pieces. Add the lemon zest, and garlic to the prepared mayonnaise, and mix. Serve room temperature with patatas bravas. Make sure to use the Mexican chorizo, not Spanish chorizo. You can find rolls of Mexican chorizo where the Mexican sour cream is sold. Most grocery stores carry it. **You may substitute french fries, if time is limited to make the patatas braves.